Mike Johnston has a great review of the Zeiss Ikon Z1 on his TOP site. 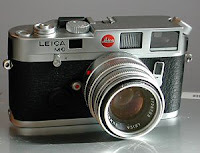 I considered this camera pretty seriously before recently buying a Leica. Perhaps if his review had come out a few months earlier I might have been persuaded. As he notes in the review, it has several straight-up improvements on the M6 --aperture priority, a hinged back, beautiful controls, you can buy it new with a warranty. In terms of raw features, it's a better camera. 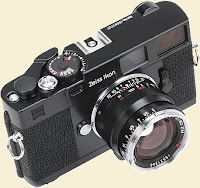 Yet it's not a Leica, and as Johnston notes in the review, this by itself can be considered a flaw. There are all sorts of arguments about which features are useful or essential, etc, but the bottom line is if you're going to spend that kind of money on a camera, why not buy a friggin Leica? It's like trying to market a new fruit. Yes, it has more vitamins, it's cheaper, it doesn't have a peel. But in the end wouldn't you rather just eat an orange? One thing that happens to me with my Leica that I didn't expect before buying it is that it starts a lot of conversations. Photographers want to talk camera shop, so I get a lot of that. But more interesting are the average folks who just see an old camera and are curious about it. They don't know what type it is but it looks mechanical and precise and that's enough to pique their curiosity. So I wind up talking to a lot of strangers on the street that I wouldn't have before. Photographically speaking, this has been very healthy. I find I am more at ease on the street when I'm interacting with people. If I walk along without talking to anyone, I tend to speed by things. I feel more like an outsider, less comfortable in my surroundings. But stop and talk to a few people and all the sudden I'm in Mr. Roger's Neighborhood. Everyone is friendly, at least in my mind, and this expectation comes through in the photos. But beyond that, the act of talking is stationary. I'm in one spot. As I stand and talk the world stops rushing by. I can take my time, look around, notice things. I am forced to slow down. Very healthy photographically. I wonder what sort of conversations I might have if I spay paint the Leica orange. Orange eating why spray painting !!! about a year ago got myself one of those more vitamins, no peel cameras with a 12 month something something and it even came in box that wasn't stored in a attic. I can live without a few of the whistles and bells attached to peeled and improved varieties. Just not too sure if I enjoy the interaction with mankind about the advantages of the orange+1 or indeed orange+2 over the orange I have in my hand. For reasons unexplained I prefer eat oranges than to talk about how brilliant they are while holding one on the street.